HP’s Pro Slate 8 Android tablet normally wouldn’t be a compelling product for us to review, but we became intrigued by the Duet Pen that’s offered with this model (and others) in the company’s Pro Slate business range. The goal is to aid pen input by allowing the user to actually write on a real paper pad. The tablet itself is an 8-inch model (part number K7X65AA) with a standard metallic look that’s reminiscent of an HTC smartphone, and it features 16GB of storage, 2GB of RAM, and comes only with Wi-Fi connectivity (4G is present in other models). It runs Android KitKat out of the box, but our device was updated to Android Lollipop during our test period. There is nothing inherently special about the way the tablet feels or functions -- it’s very much a standard piece of kit with a largely stock-looking Android installation. What sets it apart is the HP Duet Pen that is supplied in the box. 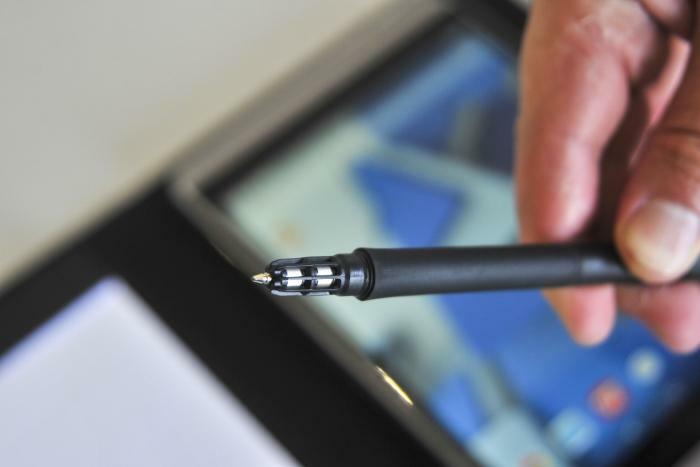 This pen is paired to the tablet wirelessly and it’s not called a ‘pen’ for nothing. The tip is removable and it has two usable ends: one end is the regular tip that can be used for when you want to write or draw on the screen, the opposite end is a regular ink tip that you can use to write on a real, paper pad. There is a light feel to the pen, it has a button for targeting a spot on the screen, and it needs to be recharged via micro-USB from time to time. In a traditional usage scenario, you would use the pen to write on the screen of the tablet (the writing performance of such is a little delayed), but this pen caters to more than just tradition. If you handle it properly, you can use it to write on a standard notepad and simultaneously see what you’ve written on paper also appear on the tablet’s screen. It’s quite a niche ability, we reckon, and also something that takes a lot of time to master if you are to use it with any sort of regular success. Writing on a paper pad has to be undertaken in a certain position next to the tablet, and within certain guidelines that you have to ascertain, mostly by trial and error. 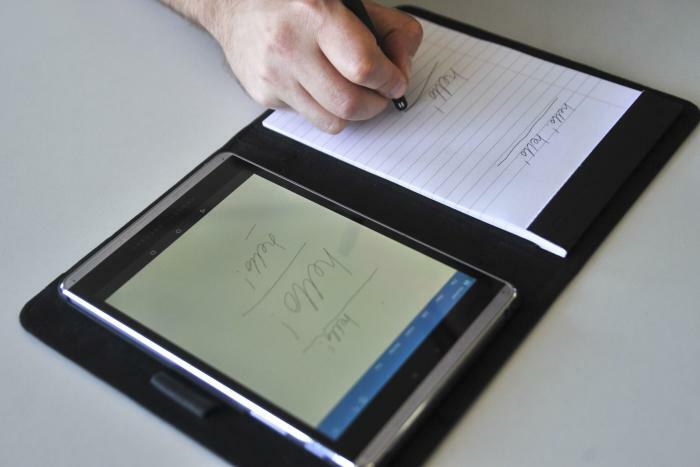 When the tablet is in its standard orientation, the pen recognition will only work if you write on a paper pad that is to the left of the tablet. It won’t work on the right side of the tablet unless you turn the tablet upside down. Sensors are used to track the position of the pen and its impact with the paper, and these are only on one side of the tablet. It took us a while to get into the swing of things when writing on the paper pad. Even then we weren't very good at it. Sensors in the pen seem to be located down near the tip, which means there is a trick to using the pen reliably: you can’t hold it low down as you write. We found that when we gripped the pen around its open, tipped area, where the positioning sensors are, the writing that appeared on the screen was jagged, and often appeared wrongly spaced, incomplete, and veered up or down the page, rather than flowing straight. We had to grip the pen up higher, leaving the openings with a clear sight to the tablet. This allowed for text to appear more legible on the screen. We found that if we covered up the exposed areas, the pen didn't perform well. But it meant that writing with the pen was uncomfortable. We had to be mindful of the button as well, with our fingers regularly pressing it inadvertently as we wrote. The ink cartridge also wasn’t great, with the tip often going dry on us and forcing us to squiggle around a bit before ink would flow again. Writing pads of the A5 size are what you need to use in order to write something within the general guidelines of the 8-inch screen, but you need to find the position of the writing pad's borders both on the left and right margins by hovering the pen on the paper and seeing where it corresponds on the screen. It will also be hard (or near impossible) to align the ruled lines of the pad with the lines in the tablet's writing app, though this can depend on the app that you use; we used the pre-installed HP Notes app, as well as MyScript Smart Note, on recommendation from HP. And, ideally, you need to use an A5 pad that is bound at the top, rather than along the side. To counter this exercise in (in)accuracy, HP supplies an accessory called the Pro Slate 8 Paper Folio (for $69), which has a case for the tablet on the right side, and a space for an A5 pad to be inserted on the right. This can make the whole writing process easier, as the pad is distanced and positioned to coincide (as best as possible) with the app's window on the screen. It’s the primary way that we wrote on the tablet during the course of our review. The results weren’t great. Text from notes that were written on paper were rarely translated with complete accurately on the tablet, and we found that writing had to be neater than usual in order for the tablet to properly convert it to text. On the odd occasion that it did convert it to text, we could output the results to a slew of services, including note applications such as Evernote, and Google services such as Gmail and Drive. What we learned is that the amount of time we spent writing and rewriting on the pad could have been more efficiently spent typing on the tablet, or indeed writing directly on the screen. So we were left with a sense of not knowing why anyone would want to use the Duet Pen for writing on paper instead. Our feeling is that it’s for the most specialised of scenarios, perhaps for uses when a paper slip needs to be filled out and a digital copy of the same needs to be kept. Though we think it would serve better as a way to keep an image of said writing as a record, rather than converting it to text. Indeed, for keeping images of what you’ve written on the paper, the Duet Pen isn’t too bad, and it takes out the step of digitising via photo or scanner. However, for handwriting recognition, we don’t think it’s a viable solution. Drawing is the other use, we suppose, but again, you need to be aware of the surroundings of the paper and flow within the margins on the tablet’s screen, and things could get very messy on the screen if you ever have to go over any lines. Another scenario that was brought to our attention was using the pen write out mathematical equations on paper, and then having the result calculated automatically by applications such as MyScript Calculator. Our thinking is that you shouldn’t trust this scenario due to the tendency of the software to autocorrect on-the-fly what you’ve attempted to write on the on the paper. The bottom line for us with the Pro Slate 8 and Duet Pen is that it will only come in handy in a limited number of scenarios where writing on paper and keeping a simultaneous digital copy of that writing in image form is a must. We don’t think it’s a good solution for typical note-taking if you are after something that can then recognise and convert that writing into editable text. The space of the 8in screen is also limiting, but HP does have a 12-inch version with a Duet Pen, too.